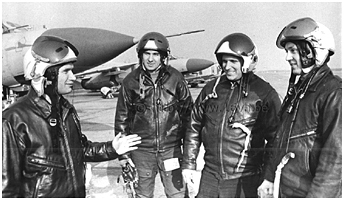 Bill Burhans served as a tour officer with the USMLM Air Team from July 1971 to June 1975. He returned in 1979 to command Detachment 16, 7113th Special Activities Squadron (the Air Team), departing in early spring 1980 following a December 1979 Soviet-originated nasty incident. He recalls for us two visits at Falkenberg airfield in 1973 with different fortunes. The MiG-23 was introduced into the 16th Air Army aircraft inventory in mid-1973 and assigned to the 31st Guards Fighter Aviation Regiment based at Falkenberg (formerly designated Alt Lönnewitz), south of Berlin. This aircraft was of considerable interest to the US intelligence community. Specifically, HQ US Air Forces in Europe was keenly interested in the capabilities of this fighter-interceptor and wanted to determine the level of threat it presented to the F-15 Eagle, the mainstay of the USAF fighter interceptor force. As a result, the Air Team at this time was focusing its attention on this priority target. Early in the morning on October 12, 1973 Larry Patterson, Mert Pennock and I worked hard to make our way undetected into the Falkenberg Soviet Airfield area. We had proceeded south from the Jüterbog area via Route 101 under the cover of darkness and took advantage of the automatic railroad drop barrier protecting the crossing at Bahnhof Beutersitz to reach our target. We established our standoff observation point in the woods that paralleled Route 101 just outside of Winkel and awaited flying activity. The first observation point lay along the normal flight path for Falkenberg aircraft. Close to the PRA boundary, it was hard to get closer to the east end of the runway. Besides that, the terrain between the main road and the airfield perimeter fence (a distance of some 5 miles) was laced with streams. To top that off, the railroad tracks linking Falkenberg and Bad Liebenwerda represented a serious obstacle to escape should the need arise for the reconnaissance tour to have to vacate the area quickly. The weather was not too good: almost complete overcast and not too much light. We set up in the OP and took turns performing security to avoid being detained. As time passed, it became clear that nobody realized we were in the area so we were able to relax a little bit. Suddenly we heard a lot of noise, obviously motor vehicles, and not too far away. This turned out to be a tactical bridging unit probably based near Bad Liebenwerda, on a road march north along Route 101 towards Jüterbog. We observed a regiment equipped with PMP ponton sections (the usual 19 vehicles comprising 2 end sections, 16 center sections, and the so-called "19th" vehicle that made up a PMP tactical ponton bridging company, plus a multitude of support vehicles) and recorded our observations on magnetic tape. This was not anything earth-shaking from an intelligence standpoint, but the noise of all those huge KrAZ-255B trucks carrying pontons and other equipment certainly kept us from falling asleep! In the end, our patience was rewarded, because the FLOGGER regiment began its flying operations. By now it was getting quite late in the afternoon and we were about to lose the little bit of light we had. After photographing a few aircraft in the landing pattern, we decided to move in as close to the PRA boundary as possible since we had not detected any surveillance and felt quite safe. As we were making our way across field trails and through open fields, Mert would stop the car so we could get shots of the underside of the aircraft on final approach passing overhead. Unfortunately, by this time the light was insufficient and our results were not very good. In addition, the flying program came to an end and there was no further activity. We packed up our gear and departed the area. We did accomplish one important thing during this collection mission. We were able to document the key fact that the FLOGGER engine produced a distinct smoke trail, making it very easy to visually acquire an approaching aircraft from a great distance. 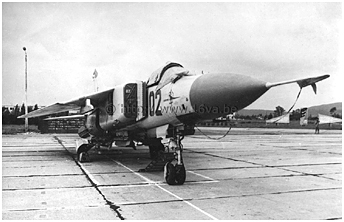 "FLOGGER C: A new generation of Soviet aircraft, the MIG-23, was delivered on 5 August to the fighter-interceptor regiment at Alt Lonnewitz. These aircraft were not flown for approximately six weeks after delivery; therefore, the presence of these high performance variable geometry aircraft within the GSFG air arm was first confirmed by an Allied Mission on 21 September. USMLM obtained extensive photographic coverage of this new weapons system on 12 October, which assisted analysts in determining that this aircraft is a two-seat version different than the FLOGGER A and B models previously observed in the Soviet Union. It is not known whether this model, which has been designated the FLOGGER C, is being used only for training or whether it is meant to be an operational two-seat aircraft with probable radar/electronics warfare officer in rear seat."